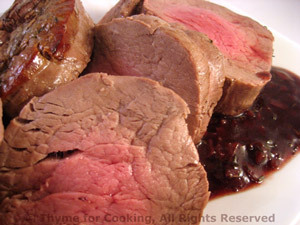 Roast Beef Tenderloin with Red Wine Sauce, Christmas Eve dinner. Holiday meals are full of tradition. You could substitute a Standing Rib Roasted and Yorkshire Pudding. As to the Asparagus.... I know, out of season and expensive, but if we can get it, we will. Get a Bûche de Noël at your favorite bakery. This is a dinner for two, but is easily expanded. Allow more time if making a larger roast. Cooking time can vary depending on the size of the roast. A meat thermometer is best. Start checking after 20 minutes for a small roast and 30 for a larger one. Remember it will cook a bit more once off the heat. Rub beef with oil, thyme and Worcestershire. 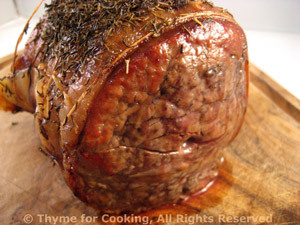 Roast in 400F (200C) oven for 25 - 40 minutes, depending on size and desired finish - 105F (48C) for rare, 115F (52C) for medium-rare, 130F (54C) for medium. The temperatures are lower than normal because it's a small piece of beef. The tenderloin in the photo was taken out of the oven at 115F, after app. 40 minutes. Allow to rest for 10 - 15 minutes before slicing. Finely chop shallots and garlic. Heat oil in saucepan medium-high heat. Add shallots and garlic; sauté 1 - 2 minutes. Reduce heat to low and add red wine. Simmer until reduced by half. Add beef stock and simmer until reduced by half again. Dissolve cornstarch in water and add to sauce, stirring until thick. Add thyme, vinegar and keep warm until ready to use. Cut the beef into 1/2" (1.5cm) slices and arrange on a warm platter. Spoon some sauce on the side and serve. I made these using 'rings' - ramekins without a bottom. Regular ramekins will work fine, just carefully turn timbale over after taking out, so that brown side is 'up'. Finely chop the mushrooms and shallots. Heat 1 tsp oil in medium skillet. Add onions, mushrooms and sauté until tender and starting to brown. Remove and set aside. Heat remaining tsp oil and add potatoes. Sauté until potatoes are starting to get tender and are partially cooked. To use ramekins: Generously butter the bottoms and sides of 2 ramekins. Pat 1/4 of the potatoes into each ramekin. Divide and add the mushroom and onion, patting down lightly. Top with the remaining potatoes. Put the cheese on top and bake (400F, 200C) until brown and bubbly, about 30 minutes. Run a knife around the edges of the ramekin. 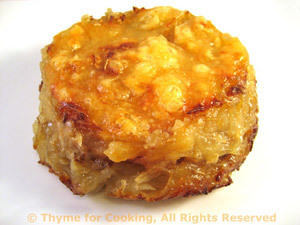 Put a plate on top and tip over, releasing the timbale onto the plate. Turn again to have brown side up. Serve. To use rings: Put 2 rings on a baking sheet that's been lightly brushed with oil. Pat 1/4 of the potatoes into each ring. Divide and add the mushroom, onion, patting down lightly. Slip a spatula under the rings and transfer to plates. Remove rings and serve. Roasted, fried, grilled - all wonderful ways to fix asparagus. Sometimes we just have to do the classic. 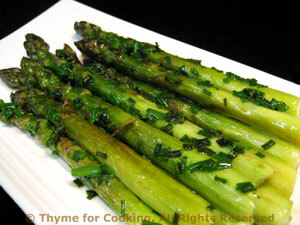 Cooking time for asparagus varies with the thickness so be careful not to overcook. I normally remove the pan from heat, but leave covered, for 7 - 9 minutes more, after the lid has reached the 'too hot to touch' point. Put into a skillet big enough to hold them without cutting, add water to cover bottom by 1/4 inch, cover and bring to boil. Lower heat and cook just until done, 10 - 15 minutes, longer for white, adding a bit of water as needed. When done drain and put into a serving dish. Return the skillet to heat and melt the butter. Add the herbs and sauté 30 seconds. Add asparagus and sauté until heated through. Put back onto serving dish and serve - adding salt and pepper if desired.